CPT’s Mark Spivak, functioning as a research consultant in conjunction with Emory University’s Neuroscience Department, co-authored a sixth research paper published in a prestigious peer reviewed academic journal. The article, entitled “Regional Brain Activity in Awake Unrestrained Dogs,” authored by Peter Cook, PhD, Andrew Brooks, PhD, Mark Spivak, CPT, and Gregory Berns, MD, PhD, describes the process the team employed to become the first research team worldwide to obtain fMRI images of non-human animals without the use of sedation or restraints. The paper also discusses the advantages of the team’s protocol and applications for the methodology. 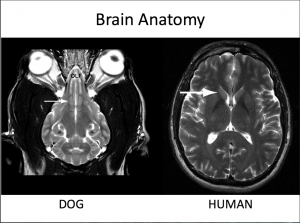 MRI comparison of a dog and human brain. Functional Magnetic Resonance Imaging (fMRI) studies brain activity over time. Due to difficulties posed by loud noise and the need for absolute motionlessness, neuroscientists once believed that it was impossible to use the technology to study animals unless the subjects were anesthetized or affixed in place. However, the team has shown that via systematic desensitization, conditioning, positive reinforcement, behavior shaping, and behavior chaining that dogs can be humanely trained to cooperatively enter the MRI magnet and remain static, without the need for sedation or restraints. Consequently, the team can use fMRI to noninvasively and empirically study canine cognition, emotions, sensory perception, receptive communication, and inhibitory control. In comparison to historical behavioral methods of research that often rely on great subjectivity when collecting and/or interpreting data, the MRI techniques offer numerous advantages for objectively studying the canine mind. Moreover, the team has advanced to where dogs have been trained to remain still for as long as 3 minutes while watching movies within the MRI bore and have been trained to perform passive and active tasks while undertaking the scanning process. The process has applications for identifying dogs best suited for working or service dog roles, improving training protocols for working, service, and pet dogs, and for small animal veterinary neurology. In addition to publication in the Journal of Veterinary Behavior, Peter Cook, the lead author, recently presented the paper as a featured speaker at the Canine Behaviour & Genetics Conference in London, England. To see a Powerpoint version of the paper, please click the following link: http://caninebehaviourandgenetics.org/wp-content/uploads/2015/08/Peter_Cook_Web.pdf.